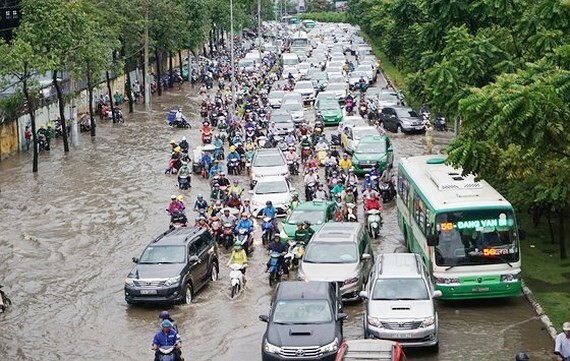 In the afternoon of May 22, Deputy Director of the HCM City flood control program Centre Nguyen Hoang Anh Dung stated the center had sent a report to the People's Committee of Ho Chi Minh City about the flooding situation after the heavy rain on May 19. According to the flood assessment criteria specified in Document No. 338 / BXD-KTQH dated March 10, 2003 of the Ministry of Construction, there were only 10 deep flooding spots in HCMC and the other 22 roads were waterlogged, said he. During the rain, the tide on the Saigon River peaked at 1.32m. This was the biggest rain since the beginning of 2018. After this rain there were 10 inundated roads and 22 waterlogged but not flooded roads in the city, according to the flood assessment criteria specified in Document No. 338 / BXD-KTQH dated March 10, 2003 of the Ministry of Construction, the report informed. Specifically, as per the report, 10 roads were submerged with flood depth from 0.10m to 0.25m, total flooded area was from 640m2 to 3,500m2. Average drainage time was from 30 minutes to 3 hours. 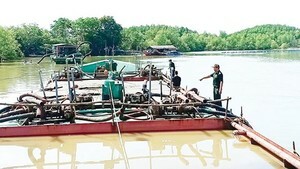 The inundated roads included Ung Van Khiem, Dinh Bo Linh, Nguyen Xi (Binh Thanh District), Road 26, Cay Tram, Phan Huy Ich (Go Vap district), Quoc Huong (Tan Phu district). Particularly, in Huynh Tan Phat street (district 7), An Duong Vuong street (Binh Tan district), Phan Anh street (Tan Phu district) even after the rain had stopped, the water retention time was about 5 hours. Apart from those flooding spots, the waterlogging existed in 22 other routes due to heavy rain that poured in a short time. These routes became dry after from 10 to 20 minutes when the rain stopped, as the water had withdrawn all. (According to the above mentioned criteria set out by the Ministry of Construction, any area is called flooded if the flooding lasts more than 30 minutes after the rain is ceased). Thus, the roads are not considered flooded include Mai Thi Luu, To Hien Thanh, Truong Son, Nguyen Huu Canh, Nguyen Bieu, Mai Xuan Thuong, Cao Van Lau, Le Quang Sung, Ton That Hiep, Calmette, Pham Van Chieu, Le duc Thọ, Le Van Thọ, Kha Van Can, Ho Van Tu, Dương Van Cam, National route 1A, Ho Hoc Lam, An Duong Vuong (district 8), Chanh Hung, Phan Van Hon, Nguyen Van Qua, the report argued.